Voucher expires 11/25/14. Please limit one voucher per customer. Wichita Falls location only. Not valid with any other offer. After you’ve claimed the deal, you’ll simply download the voucher and print it out or show it on your smart phone to redeem in person. If you haven’t been to Orange Leaf lately, this is your chance to get some yummy FroYo for FREE. Have you tried the Choclate Mint?, or the Peanut Butter?, or how about the Coconut?, or my favorite: Wedding Cake! 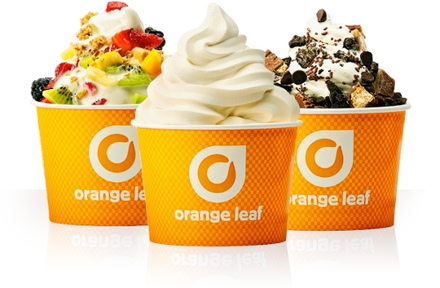 Orange Leaf is a self-serve, choose-your-own-toppings frozen treat destination unlike any other. Orange Leaf is located in the shopping center with Academy on Lawrence Rd. across from Wal-Mart.